New York & Atlantic Railway is the primary freight rail carrier on Long Island, running on Long Island Rail Road-owned track and constantly dodging commuter trains. The third-rail in the foreground is just one of many issues facing freight rail on Long Island. As we've proven beyond any doubt, the New York region is between a rock and a hard place, particularly the East-of-Hudson market. The region is beyond desperate for freight rail logistics solutions, but freight trains are mysteriously lacking in the place they are most desperately needed. We know that freight rail is one of the most efficient logistics modes that exists and has the power to solve many of the traffic, pollution, and infrastructure problems plaguing New York City and Long Island. Why, then, does the average metropolitan area import/export 15% of its freight by rail, and the East-of-Hudson market only a paltry 1%? What are the reasons behind this tragic disparity? There are many, and they range the gamut from technological, political, historical, economical, local NIMBY opposition, capacity issues, and many others. In this section, we explore the various impediments freight rail faces in its challenge to make "landfall" on geographic Long Island, Queens, Brooklyn and the Bronx. While the freight railroads serving NYC and Long Island - CSX Transportation and New York & Atlantic Railway - are committed to serving the city, they both face an uphill battle in their quest to create a robust freight rail market that New York City and Long Island deserve; in fact, so desperately need. Isn't it absolutely ironic that the largest metropolitan area in the United States, which also happens to be an archipelago of islands connected by a few roadway bridges and a decaying infrastructure, almost completely lacks access to the most efficient freight logistics mode that exists? How did we get ourselves into this mess? How could we have turned our backs on freight rail? How could we have become so dependent on trucks to bring us the goods and commodities that we buy on a daily basis? Coupled with future population projections, this is a recipe for disaster and utter chaos. Let's explore these issues... For your convenience, we have grouped them into categories. Passenger and Commuter trains have always taken priority over freight trains. Rail New York will not argue this point, as we believe moving commuters should always be the top priority. However, a greater effort must be made by the MTA-owned Long Island Rail Road to be more accommodating of freight trains on its system. We absolutely must remove trucks from the highways. Rail New York is not here to bash the passenger trains that share the same tracks the freight trains use - the Long Island Rail Road (LIRR) and Metro North. In fact, it is our belief that New York City and Long Island would be crippled if these two MTA-operated passenger services did not exist. However, throughout the course of history, the MTA - particularly the LIRR - has shown a great hostility and resentment towards freight rail. Reason being? Freight trains are generally slower, they tie up the mainline tracks when delivering railcars to industries, and the LIRR generally views them as a nuisance. 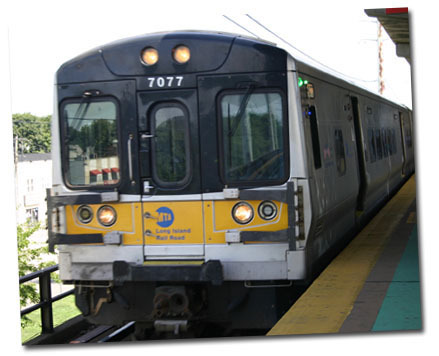 It may come as a surprise that, up until 1997, the LIRR actually operated the freight rail operations on Long Island. Then, on May 11th, 1997, the LIRR contracted the freight operations to the New York & Atlantic Railway (NYA), which operates on LIRR tracks using locomotives leased from the LIRR. 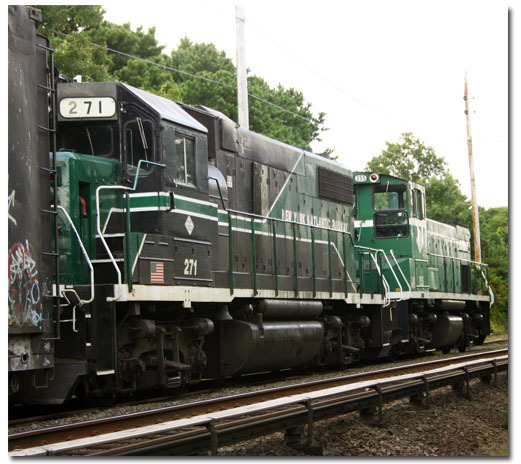 The NYA has done all it could - and still works aggressively today - to grow the freight rail market on geographic Long Island, and continues to do so with great success. At the behest of the LIRR, the NYA operates primarily late at night or in the early morning hours (we're talking 1am, 2am, etc. ), when the LIRR passenger schedule is light and few LIRR trains are racing to Penn Station. (The same schedule timing is employed by Metro North as well). This timing strategy has been somewhat successful, and has allowed the shared LIRR tracks to accommodate freight trains during the "off-peak" hours of the LIRR passenger operations. However, there are only so many freight trains that can run during these hours, and this drastically reduces the potential for freight rail delivery on LIRR trackage. Ironically, the LIRR races commuters to Jamaica and Manhattan to reduce traffic congestion on the roadways. Little did they realize the unintended consequences of this strategy: prioritizing passenger operations ahead of freight operations ended up placing more trucks on the road, doing very little to alleviate the traffic congestion they were seeking to reduce in the first place! Freight rail needs to be a much larger part of this equation, and the LIRR must be more accommodating and accepting of freight logistics. Above: This aerial view shows the condition of your average industrial area in New York City. Decaying buildings built around 100 years ago, no longer suitable for the "just in time" warehousing and distribution functions of today's global logistics chain. Not only are these buildings outmoded, they are ugly and lead to "urban blight". Image source Bing Maps. Used in accordance with Bing Terms of Service. Click here to explore the neighborhood some more. 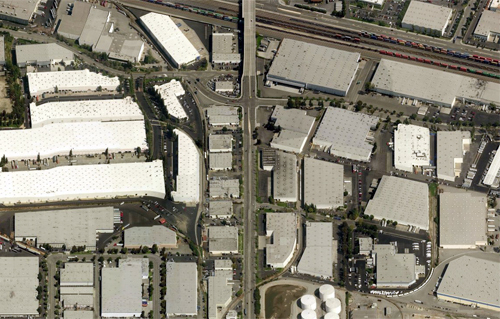 Below: This aerial view shows an industrial area in San Bernardino, CA. Notice how clean and modern the buildings are, and with rail spurs to virtually all of them. These buildings are large, ultra-modern, and built for 21st Century logistics. No "blight" here. Imagine if New York's decaying urban areas were transformed such as below. New York must move in this direction if it has any chance of saving its future. Image source Bing Maps. Used in accordance with Bing Terms of Service. Click here to explore San Bernardino's modern industrial neighborhoods some more. Have you ever been to some of New York City's industrial areas? What do they look like? Old brick buildings that were built generations ago, back when the city was a major manufacturing center and had a flourishing industrial sector. Today, all of the heavy industry is gone; since relocated to other parts of the country where companies could build more modern facilities. This has left New York City with a portfolio of decaying and blighted industrial buildings that no longer serve their original purpose. There is no doubt they are ugly, outmoded, antiquated, and need to be replaced. 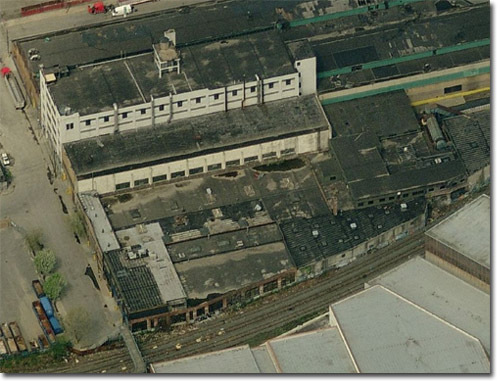 They are expensive to maintain, are not properly configured for the warehousing/distribution needs the geographic island desperately needs, and yes - the once bustling industrial areas of New York City have since turned to blight since these buildings have not been replaced. What's more, they look abandoned: broken windows, boarded up, covered with graffiti. They are no doubt decaying, and bringing down the value of surrounding neighborhoods, indirectly eroding the city's tax base as well. Who wants these buildings as part of our urban fabric? It is our theory that New York's decaying industrial building stock is negatively shaping the public opinion on industry, leading many New Yorkers to believe industry is "ugly" and a thing of the past. New York City is no longer - and will never again be - the major manufacturing center it once was in the early part of the 20th Century, particularly the years leading up to World War II. Today, as everyone knows, the "Capital of the World" is primarily a service-sector economy. Gotham is has since changed roles, with soaring glass and steel skyscrapers proclaiming our might as one of the world's premier financial and corporate centers. Many people ask: "Is there even a need for an industrial base in New York? Can't we just turn these factories into condos and lofts?" The answer to that is clear once you begin to understand logistics. While there is no longer a need, purpose or demand for heavy manufacturing in New York any longer, there is an absolute need for warehousing and distribution functions, operations mainly conducted in "clean" warehouse buildings. Geographic Long Island is quickly approaching 8 million people in population, the East-of-Hudson region has even more people. Imagine the amount of commodities and goods that a population like this demands. The every-day items we consume don't just magically appear on the shelves of the supermarket or your local Target store. They must be imported and, today, are mainly imported by trucks from warehouses in New Jersey. As was discussed previously and as we will expand upon later, there is an urgent need for geographic Long Island and the East-of-Hudson region to import its cargo by freight trains and conduct its own warehousing and distribution functions, hence... the need for industry to exist. We're not talking smoke-belching factories here, we're talking clean and modern warehousing and distribution facilities. Unfortunately, our existing building stock is simply too out-of-date to serve these functions. While our river crossings such as the Verrazano Narrows, George Washington, Whitestone and Throgs Neck Bridges are choked with traffic and high tolls, New York City is sitting on an abundance of outdated and decaying industrial buildings and blighted industrial neighborhoods. The businesses that DO occupy these buildings are threatening to move to New Jersey, citing the age and high cost to maintain and/or renovate these buildings to their specifications (refer to Hostess/Wonder Bread in Jamaica for proof of this. Click Here for Link to Daily News Article). If you are an astute observer, you can already predict our solution to this problem coming in the "Solutions" section of this website. 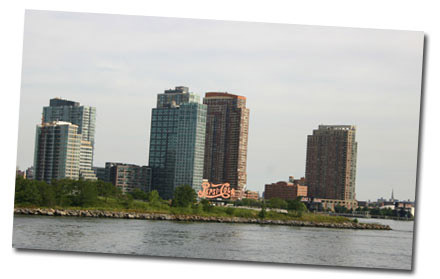 The redevelopment of Long Island City's waterfront is a perfect example of "gentrification", turning former industrial areas into upscale residential and retail centers. While often romanticized and celebrated for removing "blight", very few people realize this concept is actually counter-productive. These industrial areas need to be redeveloped as revitalized industrial areas to handle the East-of-Hudson region's warehousing and distribution needs. Simply put, geographic Long Island needs industry, and replacing industrial zones with residential towers and retail centers is senseless. This issue directly hinges on the issue of outdated industrial buildings we discussed above. Cities evolve, there is no question about that. New York City is no different. While this can generally be a positive trend, it comes at an expense if the city continues to replace/rezone industrial areas to build new residential, commercial, and retail development. (On the same topic of Hostess, see what the hope is for the future of the shuttered plant. Click Here). This is essentially taking away geographic Long Island's ability to conduct its own warehousing/distribution functions using rail as the primary import mode, and only exacerbates the aforementioned problems brought about by the lack of freight rail in NYC/Long Island. We've seen the changes taking place in many "new, upcoming and hip" areas of the city, with new lofts and art galleries . Admittedly, as discussed above, many of the city's industrial properties are blighted, dillapidated, and outmoded; the buildings are old, decaying, and can NOT accommodate the functions of any high-tech warehousing/distribution operation. We know the city views these areas as "ugly" and blighted, but instead of incentivizing the rehabilitation of these critically-needed industrial areas with new and modern warehouses, these areas are instead transformed into residential, commercial and retail neighborhoods. Just for a second... think about how foolish this is: the city is reducing the geographic island's ability to serve its own warehousing and distribution functions, while at the same time increasing the island's population and increasing the demand for goods that must be imported. Did anyone say "more trucks"? That's exactly what we're going to get if this trend continues. Brace yourself for more traffic congestion, pollution, and an ever-worsening roadway infrastructure if New York continues to turn a blind eye to its industrial sector. We do realize this is perhaps one of the most controversial points we will make on this website, as "gentrification" is widely-celebrated as urban renewal. However, the long-term ramifications of ongoing gentrification will ultimately cripple geographic Long Island's ability to have sufficient industrial capacity to handle the island's warehousing and distribution functions, while at the same time increasing the demand for commodities that must be delivered by trucks. We've all seen the "success stories" in the media about how economic development agencies in New York have made great strides in re-introducing freight rail to the city. There are some successes, we won't disagree. The reconnection of Staten Island to New Jersey via rail, the New York Container Terminal (actually, a major victory), the recent grant to rehabilitate the city-owned NYNJ Rail car float operation, the opening of 65th St. Yard in Brooklyn, etc. But despite these "token" successes, how is it that the city overall still only imports about 1% of its freight by rail? While, granted, these are improvements, they do very little to achieve the massive logistics revolution the city and geographic Long Island need. Perhaps it's because of the impediments to freight rail (both aforementioned and the ones listed below) that our politicians and economic development agencies have "given up", but at what cost to the city and our Quality of Life? It's easy to grab low-hanging fruit, but what about the bigger picture? That is one of the reasons this website exists, and one of the reasons we are attempting to get as many people involved with DEMANDING a freight rail revolution in Gotham. 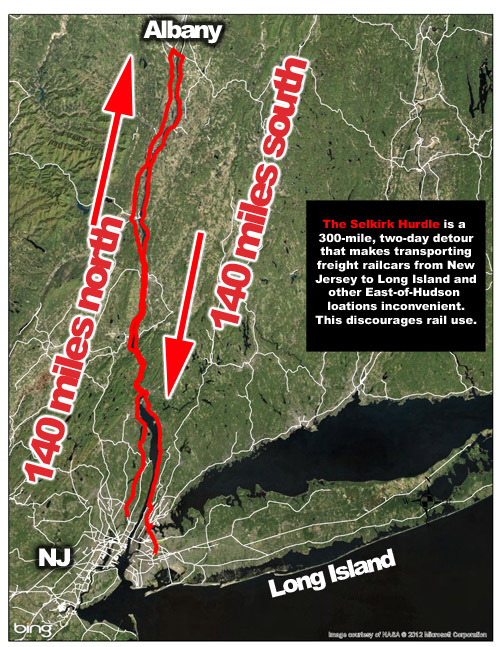 The "Selkirk Hurdle" is a common phrase used by rail experts, planners and politicians along the east coast to describe the lack of a direct rail connection from New Jersey across the Hudson River to geographic Long Island. The nearest freight rail bridge is in Selkirk, NY, a few miles south of Albany. This results in a 300-mile detour for freight trains that are bound from many parts of the mainland United States to geographic Long Island, and adds two days to the journey plus significant additional cost. As one might imagine, this "hurdle" is a detour that significantly reduces the efficiencies of routing a freight railcar to geographic Long Island, particularly railcars originating or destined to and from southern states. This, in turn, ultimately makes shipping charges more expensive for the shipper, adds unnecessary travel time to the total journey of the railcar, and makes freight rail less competitive with the trucking industry for bringing cargo to New York City and geographic Long Island. The Selkirk Hurdle is also another reason northern New Jersey serves as the primary warehousing and distribution center for NYC and Long Island, which then sends cargo across the Hudson River via truck. Not good. Back in the first half of the 20th Century, many of the freight railroads serving the New York market utilized "car floats", marine barges with tracks on which railroad cars were floated across the Hudson River and then pulled off the barges on geographic Long Island where they would reconnect with the rail network once again. In its heyday, over 600,000 railcars per year were floated across the Hudson; today, less than 2,000 railcars are floated across. This is a scant figure, and does virtually nothing to solve the region's transportation woes. While it is helpful and we admire the pro-active efforts behind the concept, today's only existing carfloat operation - the PANY-owned NYNJ Rail - barely makes an impact at taking trucks off the city's limited number of roadway bridges. Floating railcars across the harbor is not the major rail revolution that the region needs. A better option - and only option - is the proposed Cross Harbor Freight Tunnel linking New Jersey directly with Brooklyn, allowing trains to cross the Hudson without any impediments. Then, and only then, will geographic Long Island be fully integrated with the North American rail network. This is the only way forward. Ever since the advent of freight railroading in continental North America, railroads have been struggling with how to connect East-of-Hudson islands with the mainland United States. The ambitious Pennsylvania Railroad constructed underwater tunnels to Penn Station, thus making a direct connection. This, however, was only for passenger trains. For over 100 years, there have been numerous plans - in various iterations - to establish a direct connection for freight trains. While no infrastructure connection was constructed, the various freight railroads serving the New York area used "car floats", or barges with railroad tracks, to send the railcars across New York Harbor via barge. While not a permanent solution, it worked at the time. Today, only one barge operation remains (NYNJ Rail), and only 2,000 railcars per year are floated across the harbor. 1998 figures for *total* railcars imported to Bronx, Kings, Queens, Nassau and Suffolk counties were 1,415,609 railcars. Estimates for the year 2025 project that 2,539,607 railcars will be destined to these five counties. (These figures come from the report Rail Freight Yard Requirements/Land Assessment, March 2003, New York Metropolitan Transportation Council. Click Here for Link). Anyone can see that the scant 2,000 cars NYNJ Rail "floats" across the Hudson is negligible, and barely makes a dent in 1998 figures, let alone 2025 estimates. This is less than 1%; in fact, barely above half of one percent. It is beyond dispute that the Cross Harbor Freight Tunnel must be built. The good news is that it will, eventually, but only after it becomes "too late". An Intermodal Terminal (left) is a specialized railyard where cranes load and unload truck trailers and shipping containers onto railroad flatcars. A facility like this on geographic Long Island would take a substantial number of trucks off the highway bridges. Also notice the "doublestack" container train (middle of picture, red containers). These trains are termed "doublestack" because shipping containers are stacked ontop of one another for maximum efficiency. Trucks will always be a part of the region's logistics picture, this is something we can't deny. Not every factory or warehouse on mainland North America has access to rail service, and not every distribution center on the receiving end of the supply chain has access to rail service. Thus, long-haul trucks will always play a critical part in the nation's and region's transportation scheme. Intermodal combines the best of both worlds: It allows a highway trailer or shipping container to be loaded onto a flatcar, travel by rail across the country, and then unloaded at another terminal on the other side of the country. The trailer or container is then driven a short distance to its final destination. 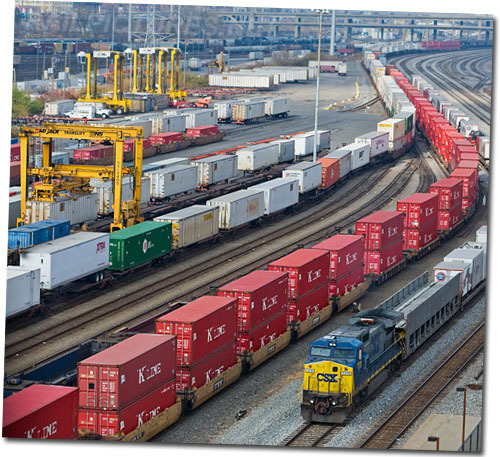 Essentially, there are two types of intermodal service: TOFC (Trailer on Flatcar, also commonly known as "piggyback"), where your standard truck trailer is loaded onto a railroad flatcar; and COFC (Container on Flatcar), where international and domestic shipping containers are loaded into special low-riding railcars and stacked ontop of one another (no more than two stacked together). While trucks are still involved in the logistics move, the primary segment of the trailer's or container's journey is by rail, thus reducing traffic and air pollution. The carbon footprint for the journey of the trailer or container is much smaller when rail is involved. This picture illustrates the third rail running along most of the Long Island Rail Road trackage on geographic Long Island and a portion of the Metro North system. Since it is so close to the tracks, the third rail prohibits many types of freight railcars from operating on such trackage. Principal among the railcars banned from third rail trackage is the crucial "doublestack" container car widely used in intermodal service. Third Rail is a concept very familiar to New Yorkers, but largely unfamiliar to other Americans. 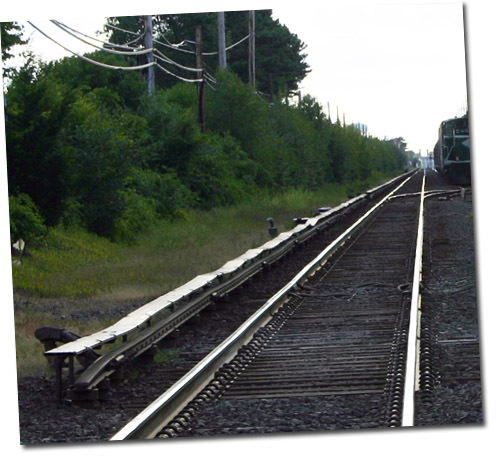 The use of third rail - a physical rail remitting electricity and running alongside the tracks - is principally used in New York City and Long Island almost exclusively. All of North America's freight trains and most commuter trains outside of Gotham are powered by diesel locomotives, which do not require electrical pickup and can run on standard, non-third rail track. New York City and Long Island, however, primarily use commuter trains powered by electricity, hence the presence of a third rail. (The reasoning behind this is that diesel fumes would otherwise smog up Manhattan's underground tunnels and cause health and visibility issues). Third rail poses problems for freight trains that are allowed to traverse the commuter tracks of both Metro North and the LIRR. Since the third rail is so close to the track, freight trains are somewhat limited in the types of railcars they can introduce onto third-rail trackage. Even diesel-powered freight locomotives have to be modified so that they don't "scrape" or hit the third rail on their journey into New York. Particularly, the "plows" on the front of these freight locomotives have to be "notched" - the lower edges cut off - so the locomotives can clear the third rail. Fortunately, the vast majority of railcars in universal service can travel on third-rail trackage without any issues. Unfortunately, as mentioned in the previous section, one particular railcar that is prohibited from operating on third-rail trackage is the "doublestack" container car widely used in intermodal service, also known as a "well car" because the bottom of the car drops down lower than your standard freight car, riding only inches above the railhead. This vertical depression in the car is necessary to allow two shipping containers to be stacked ontop of one another and allow the railcar to pass under most bridges and tunnels in North America. On standard, non-third rail trackage, this low-riding railcar has no issues; in third-rail territory, this type of car would "side-swipe" third rail on curves, causing major damage. It is absolutely prohibited from operating on track featuring third rail, striking a major blow to the introduction of intermodal service on Long Island unless the Cross Harbor Freight Tunnel is constructed (as we will discuss in "Solutions", the proposed tunnel would circumvent the third rail issue and allow this popular intermodal railcar to make landfall on Long Island). 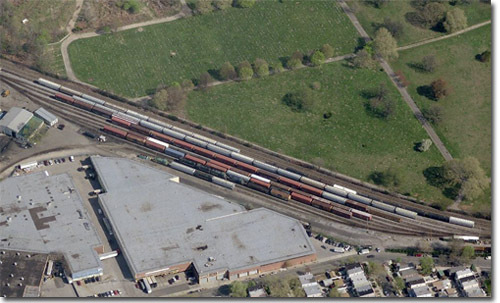 This aerial view of Fresh Pond Yard in Glendale, Queens, shows how small the facility is. Yet, this yard serves as geographic Long Island's primary freight railyard. Image source Bing Maps. Used in accordance with Bing Terms of Service. Click here to explore the neighborhood some more. Yet another impediment to increasing freight rail use on geographic Long Island and other East-of-Hudson locations is the lack of railyards on the island. What's more, the few railyards that do exist are undersized and incapable of handling the number of railcars that would come to Long Island should our freight rail revolution come to fruition. Will this ultimately be the issue that prevents us from increasing the use of freight rail? No worries, there is hope, and we will address that in the "Solutions" section of this website. For now, let's just get a briefing on the issue. Currently, the largest and principal freight railyard on geographic Long Island is Fresh Pond Yard, located in Glendale, Queens. This is the railyard where the New York & Atlantic Railway assembles its trains to hand off to CSX Transportation, which then takes the train north over the Hell Gate Bridge and to points all across North America. Fresh Pond, compared to other railyards, is incredibly small - only 15 classification tracks and a very limited capacity for freight car storage. Even worse, geographic Long Island lost a major freight railyard when the freight-only "Yard A" at the Sunnyside Yard complex in Long Island City was removed to make room for the Long Island Rail Road's East Side Access project. Many of the bridges and tunnels, in the era of New York's infrastructure buildup, were constructed during the first half of the 20th Century when freight railcars were much smaller - both in height, length, and weight. Today's modern railcars dwarf the cars of the past, being more than twice as tall, twice as heavy, and twice as long as their predecessors from 60 years ago. This means a great number of bridges and tunnel portals in the New York region (not just East-of-Hudson), are "too low" to allow today's modern railcars to pass underneath. Let's focus on East-of-Hudson for the purposes of this website. The "clearance envelope" for many bridges and tunnels on Long Island ranges from as tall as 17' 6" to as low as 14' 6". This poses no problems for LIRR's commuter trains, which are generally shorter in height than freight railcars. On a positive note, many of today's freight cars can, in fact, pass under these low clearances. However, there remain some "high cube" boxcars (taller boxcars now becoming the industry standard) and of course, the "doublestack" container cars (also becoming the industry standard in the intermodal sector) that cannot make it underneath these low bridge and tunnel clearances. In fact, there is no bridge or tunnel on Long Island - at all - that would allow a double-stack container car to pass underneath. The doublestack car, when loaded with two containers as is standard practice, has a total height of 20' 6". The highest clearance on all of Long Island is 17' 6". See the problem? The East-of-Hudson region simply lacks the adequate infrastructure capable of handling today's modern railcars. There is a solution to this, as you will soon see. Finally, the last impediment to increasing freight rail on Long Island are weight restrictions on much of the LIRR track. As mentioned before, today's modern railcars dwarf their predecessors, and today railcars can weight as heavy as 286,000 lbs. Even more troubling, there is a trend towards railcars that can weigh in at a whopping 315,000 lbs., although the movement to these super-heavy cars isn't significant as of this writing.